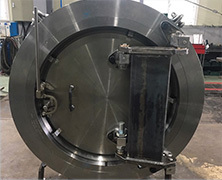 Design, construction and fabrication of Quick opening closure for pressure vessls for all ranges of technical application in accordance with all common pressure vessel codes or customer's specifications. The quick opening doors are equipped with all safety devices required. Quick opening closure with manually or hydraulically opening mechanism. Available for horizontal or vertical vessels.